"Preserving The Equestrian Way Of Life"
What a great day! Kathryn must surely be smiling. 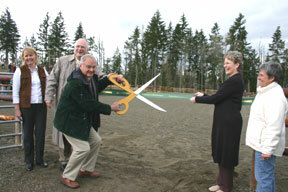 After 20 years of negotiation, persistence and dogged determination, the Kathryn Taylor Equestrian Park opened its gates on Saturday, April 5th. We celebrated this achievement in great style and with amazing support and turnout from equestrians throughout the area. We estimate that over 250 people attended which was really wonderful to see. We had riders from the King County Mounted Posse to greet folks with their palominos and shiny silver tack. Along side them were knights in shining armor from Seattle Knights. 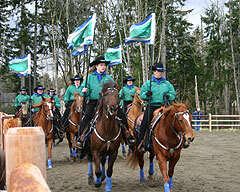 The High Valley Riders equestrian drill team put on an amazing show and christened the new arena in great style. KCEHC sincerely thanks all of them for their support of the event, their participation contributed significantly to the celebration! With the winter-like spring we have been having we were all worried about the weather but although it was cloudy and cold, there was no rain. With our partner, Northwest Parks Foundation, we arranged for catered refreshments (thankfully some warm food and drink!) and a tent just to be safe. The catering was provided by Innovative Events who did a great job providing fruit, veggies, hot appetizers, yummy cookies and a fantastic cake, all with an equestrian theme. The event began with people eating, drinking and wandering the site to see the amenities. In addition, to the round pen and arena, the Kathryn Taylor Equestrian Park (KTEP) subcommittee, and specifically Judy Westall, arranged for a mounting block and hitching rail to be installed prior to the event. King County also completed the kiosk for the Park which gives a history of the Park, a write up about Kathryn herself, park rules and a trail map. Kristen Bush, Director of Northwest Parks Foundation and leader of the KTEP subcommittee greeted the crowd and provided an overview of Kathryn�s contribution to the equestrian community and the many partnerships that made the park a reality. She introduced members of the KTEP Subcommittee including NW Parks Foundation�s Jan Burnette and Suzanne Kagen and King County Executive Horse Council�s Kelly Boyd, Jennifer Duncan, Joan Fleming and Judy Westall. This committee managed the planning and construction of the site. The committee worked closely with King County Parks and Quadrant Homes to secure the transfer of committed funding, plan and manage the horse amenity construction, and manage the maintenance endowment. Kristen also thanked Northwest Dirtworks who constructed the round pen, arena and parking lot and were fabulous to work with. Sharon Clausson spoke on behalf of King County Parks and Bonnie Geers spoke on behalf of Quadrant Homes. In addition, King County Councilmember Kathy Lambert attended and spoke about the County�s continued support of equestrian interests and future plans to enhance equestrian access to trails in other areas of the County (we plan to follow up to learn more about those plans!). A highlight of the event was the attendance of Kathryn�s two brothers, David and Fred Taylor. They spoke very eloquently about their sister, her love of horses and dedication to equestrian interests. The brothers were shown a picture of a bronze plaque that will be installed at the site to commemorate Kathryn. It will include an image of Kathryn on her horse, Rocket and the words �This equestrian park is dedicated to Kathryn Taylor in recognition of her vision for this park, her countless volunteer hours & leadership in preserving the equestrian lifestyle everywhere. Kathryn Gave Us All �A Leg Up!� We look forwarding to installing the plaque as soon as it is ready. Look for it to be placed in a stone or cement monument between the arena and round pen sometime this summer. So�we have a wonderful new facility that will provide equestrians throughout the County with a safe and pleasant location in which to enjoy the horses we love. We hope you plan a trip to the Park soon and use it often. The Park is alongside the Tolt River Pipeline trail which provides trail connections to Redmond Watershed, Farrell McWhirter Park and the Snoqualmie Valley Trail. You can view directions to the park, print a park flyer, and review park information and rules from our website.